Regular readers of re: The Auditors will be familiar with Mark O’Connor and Monadnock Research. Mark has written some very insightful guest posts for me and was interviewed for the special accounting industry issue of Crain’s Chicago Business a last fall. re: The Auditors and Francine McKenna are not being compensated for this post. This is not a sponsored post. Global non-audit advisory services of Big Four firms, including tax services, increased to $64.73 billion in fiscal 2013 (in USD here and throughout), a 5.47% increase over fiscal 2012 levels. Total non-tax consulting and advisory services of Deloitte, KPMG, PricewaterhouseCoopers and Ernst & Young were $38.54 billion, an increase of 6.8% over fiscal 2012. Overall, Big Four fiscal 2013 growth was only about half that of last year in most categories. That growth in advisory, however, contrasts sharply with an overall increase of 3.15% for the Big Four across all service areas, and just 0.25% growth in audit services. KPMG’s audit revenues actually declined for a second year by approximately 1%, joined by PwC, whose audit revenues decreased by 0.7 percent. 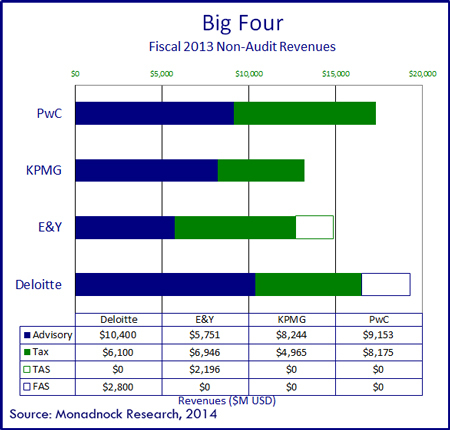 This is the fourth year that Monadnock Research has published analysis of the consulting and advisory services operations of the Big Four. We note that the Big Four continue to seek organic growth and strategic M&A in non-audit services. This Research Note offers an in-depth analysis of that, highlighting the growing risks associated with an increasing proportion of advisory relative to audit services at Big Four firms – and the conflict risk that this unique mix of services presents. Our analysis shows that the aggregated fiscal 2012-2013 ratios for audit to non-tax advisory revenues for the Big Four continued its shift toward increased conflict risk, albeit at a slower pace. The exhibits below detail increases in Audit Conflict Risk Exposure Metrics from fiscal 2012 to 2013. Relevance of the metrics themselves is discussed in more detail in the “Conflict Risk Exposure Metrics” and “The Audit Underwriter Paradox” sections below. Deloitte again tops the rankings as the largest global provider of non-audit non-tax advisory services, with $13.2 billion in revenues, an increase of 6.45 percent. PwC continues as the Big Four’s second largest non-tax advisory services firm with $9.15 billion in revenues, up 5.18 percent. KPMG’s $8.42 billion was up 4.88%, and Ernst & Young finished the year with around $7.95 billion in non-tax advisory revenues, leading the Big Four in not tax advisory growth of 11.5 percent. 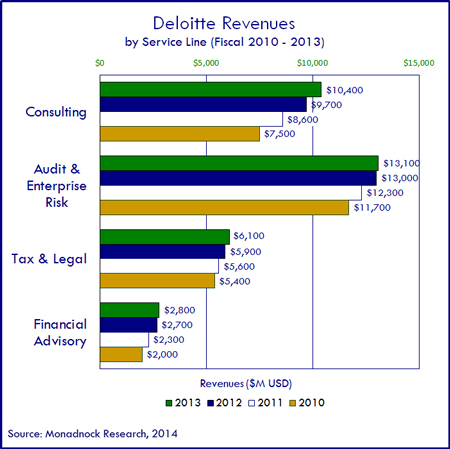 Including tax advisory in the non-audit consulting and advisory services mix of business, Deloitte led the group with $19.3 billion in Fiscal 2013 revenues. PwC was close behind with $17.33 billion. Ernst & Young and KPMG were third and fourth with $14.89 billion and $13.21 billion in total non-audit revenues, respectively. PwC led the Big Four’s $26.2 billion tax advisory segment with $8.18 billion, an increase of 2.91% – ranking third in rate of tax advisory growth among the Big Four. Ernst & Young ranked second in tax, with $6.95 billion in revenues, up 5.58% over fiscal 2012, leading the Big Four in tax segment growth. Deloitte ranked third with $6.1 billion, up 3.39% and ranked second in tax category growth. KPMG ranked fourth with $4.97 billion in global tax revenues, with the slowest growth among the Big Four at 2.16 percent. The following four sections contain more detail on the fiscal 2013 results of each Big Four firm. Deloitte recaptured its claim to the title of largest private professional services firm in global revenues from PwC in fiscal 2013. Aggregate Deloitte member firm revenue was $32.4 billion, growing by 3.51% in fiscal 2013. Deloitte continues to lead the Big Four in headcount, with 202,885 staff members globally at the conclusion of its fiscal year on 31 May. Deloitte was the second fastest growing practice among the Big Four in fiscal 2013 for non-audit advisory services, growing by 5.46% over fiscal 2012 to $19.3 billion. Audit revenues grew by just 0.77% to $13.1 billion. Regionally, Deloitte’s $11.1 billion in Europe, Middle East and Africa region growth slowed to 1.83%, compared to 2012’s growth of 5.83 percent. Americas revenues grew at the fastest rate, increasing by 5.81% to $16.4 billion. Asia Pacific revenues were flat at $4.9 billion after curiously experiencing rapid growth of exactly 16.7% for two consecutive years. The firm had 10,189 partners globally at the end of F-2013, up 2.42% over 2012. Partners represent 5.02% of the professional staff. Professional staff numbered 157,505 globally, up 5.75 percent. Administrative staff was 35,192 globally, up 2.11 percent. Total global staff was 202,885, up a little more than 4.9 percent. Deloitte had revenues of $6.4 billion from clients in Consumer and Transportation Industries, unchanged from 2012. But this occurred only after Deloitte changed its reported fiscal 2012 revenues that were reported at $6 billion in its financial statements last year. Clients in Energy and Resources accounted for $3 billion in revenues, up 7.4%; $9.1 billion in Financial Services, up 1.1%; $2.6 billion in Life Sciences and Healthcare, up 13.04%; $4.3 billion in Manufacturing, up 4.88%; $3.5 billion in Public Services, up 6.1%; and $3.2 billion in Technology and Media, up 2.9 percent. PricewaterhouseCoopers (PwC) again lost the moniker of “world’s largest professional services firm” to Deloitte in Fiscal 2013, by a narrow margin of less than 1% of revenues. Aggregate Fiscal 2013 PwC revenues were $32,089 billion for its worldwide network of member firms for the period ended 30 June, a growth rate of just 1.84% over fiscal 2012. PwC’s F-2013 global non-audit revenues were $17.33 billion, an increase of 4.1 percent. Tax revenues were up by 2.9% to $8.18 billion. Audit/Assurance work slipped by 0.7% to $14,761 billion. The total non-audit advisory work, excluding tax, was $9.15 billion in fiscal 2013, an increase of 5.18 percent. That means PwC had the second slowest rate of growth among the Big Four in this important category where less growth is a positive thing from a conflict perspective. 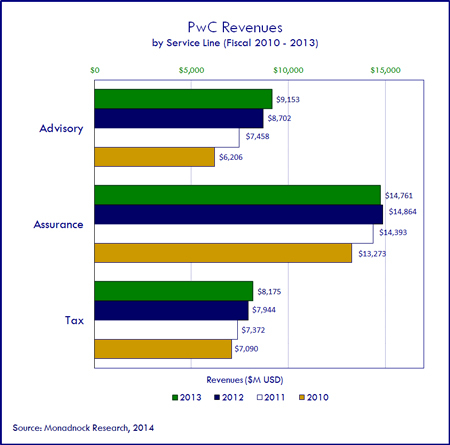 Considering non-tax advisory services only, PwC ranks a distant second to Deloitte’s $13.2 billion. But it is important to remember that fiscal 2013 closed before the Booz transaction occurred, so fiscal 2014 will see a significant decrease in PwC’s audit revenues as a percentage of total revenues. PwC is the world’s largest auditor, with global assurance revenues across all member network firms of $14.76 billion, representing 30.12% of the Big Four’s $49 billion in total audit revenues. PwC’s audit revenues actually decreased by 0.69%, surpassed only by KPMG’s 0.96% audit revenue decline. The firm finished its fiscal year with 184,235 total staff, up 2.05% over fiscal 2012. Net staff turnover was 18.72%, up 4.64 percent. Professional staff was up 2.42% to 143,111. The number of partners increased by 2.4% to 9,597. PwC’s staff represented 25.75% of the Big Four’s 714,318 employees and its senior leaders represented 25.45% of the Big Four’s 37,715 total partners. PwC had $3.71 billion in Asia revenues, down 0.59%; $1.64 billion in Australia and the Pacific Islands, down 2.32%; $809 million from Central and Eastern Europe, down 0.86%; $11.83 billion from Western Europe, down 1.3%; $1.074 billion from the Middle East and Africa, down 1.07%; an even $12 billion from North America and the Caribbean, up 7.27%; and $1.1 billion from South and Central America, up 6.35 percent. PwC had revenues of $4.17 billion from clients in Industrial Products, down 0.43%; $4.27 billion in Banking and Capital Markets, up 4.2%; $4.01 billion in Asset Management revenues, up 1.87%; $3.7 billion in Retail and Consumer revenues, up 0.13%; $2.73 billion in Energy, Utilities and Mining, up 5.6%; $899 million in Health Industries revenues, up 5.65%; $2.02 billion in Technology revenues, up 3.52%; $1.86 billion in Public Services revenues, up 3.66%; $1.51 billion in Insurance revenues, down 0.25%; $1.35 billion in Media and Entertainment revenues, up 4.36%; $1.7 million in Professional Services revenues, down 5.28%; $1.2 billion in Pharmaceuticals and Life Sciences revenues, up 4.55%; $835 million in Automotive revenues, down 5.4%; $835 million in Information and Communications revenues, up 5.9%; and $963 million in revenues in Transportation and Logistics, up 1.87 percent. KPMG had combined revenues of $23.42 billion for its fiscal 2013 ended 30 September, a 1.69% increase. KPMG’s total non-audit revenues were $13.21 billion, an increase of 3.84% over fiscal 2012. KPMG’s non-audit non-tax services were $8.24 billion, an increase of 4.88 percent. 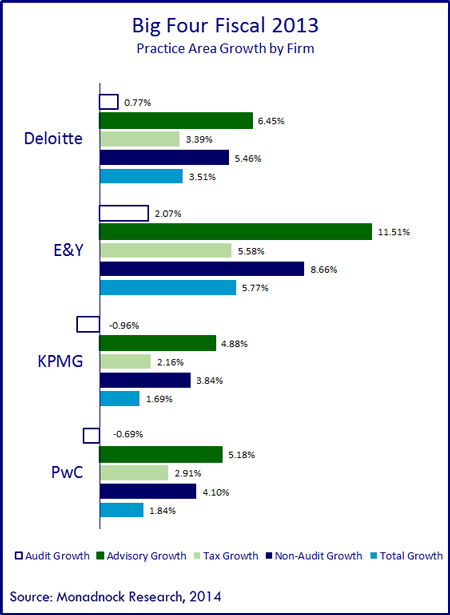 KPMG’s non-audit services were the lowest of the Big Four, but its non-audit non-tax ranked third, behind Deloitte and PwC, respectively. KPMG’s tax advisory practice grew by 2.16% to $4.97 billion. 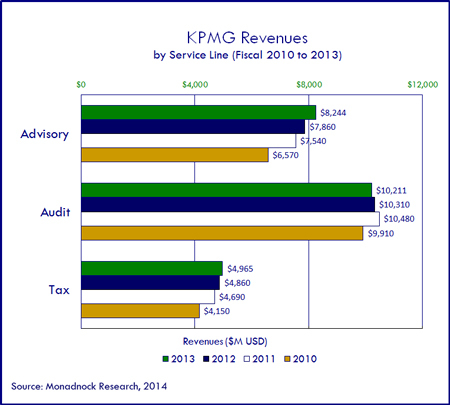 Global revenues for fiscal 2013 in KPMG’s Audit services totaled $10.21 billion, down 0.96 percent. KPMG’s global headcount increased by 1.83% to 155,180 in fiscal 2013. Partner headcount increased by 0.46% to 8,664. Professional staffing increased by 2.12% to 119,675. Administrative staff increased by 1% to 26,841. Americas revenues were up 5.63% to $7.87 billion in fiscal 2013; EMEA revenues were $11.64 billion, up 1.13%; and revenues from the Asia Pacific region were $3.91 billion, down 3.9 percent. KPMG had revenues of $7.01 billion from clients in Financial Services, up 0.14%; $5.89 billion in Industrial Markets revenues, up 1.03%; $2.78 billion in Consumer Markets revenues, up 2.21%; $2.58 in Information, Communications and Entertainment, down 1.15%; and $5.16 billion in Infrastructure, Government and Healthcare revenues, up 5.95 percent. Ernst & Young had combined global revenues of $25.83 billion for its fiscal 2013 ended 30 June, up 5.77 percent. Total advisory revenues, including tax, were $14.89 billion, making it the third largest provider of advisory services of the Big Four. Advisory excluding tax was $7.95 billion, up 11.5% over fiscal 2012, making it the fastest growing of the Big Four in non-tax advisory services. 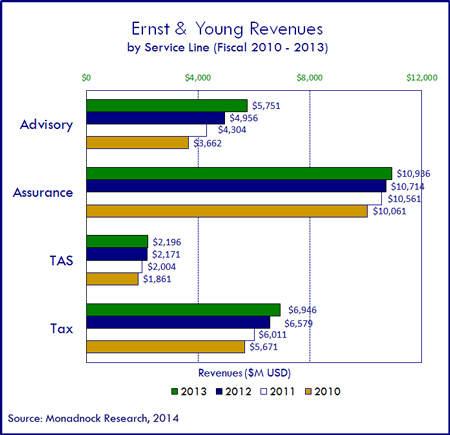 Ernst and Young’s revenues by service line increased across all areas, finishing fiscal 2013 with total global network revenues of $24.83 billion. 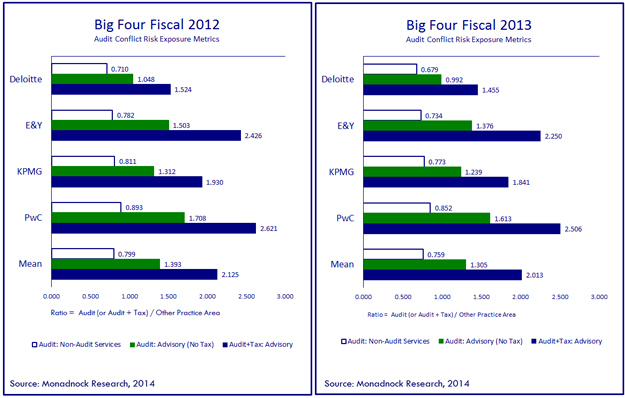 As with every other Big Four firm, Assurance revenues trailed performance of all advisory areas. EY’s Assurance revenues, however, were up around 2.07% to $10.94 billion, where it led the Big Four in 2013 audit practice growth. Advisory revenues were $7.95 billion, up 11.5%, including Transaction Advisory Services. Tax advisory revenues were $6.95 billion, up nearly 5.6% for the second consecutive year. Global headcount for the firm was 174,808, up 10.13 percent. EY does not report partners globally, but we estimate the number of partners at around 9,100 worldwide. EY had Americas revenues of $10.94 billion, up 4.63%; $10.9 billion in EMEA revenues, up 4.63%; Asia Pacific revenues of $2.93 billion, up 4.3%; and $1.2 billion in Japan revenues, down 9.5 percent. The Big Four will continue to take advantage of the effects of global financial uncertainty in 2014 before a strong recovery takes hold. This protracted downturn has disproportionately affected smaller and mid-sized consulting firms, and those that were not as well capitalized going into the financial crisis. The Big Four are also benefiting from a trend in consulting services sourcing and procurement where the business of smaller and midsized consulting firms is being redirected to large global professional services firms. This shifting of even more business to the largest practitioners means that they have been somewhat shielded from the economic downturn by their growing share of a shrinking or moderately growing pool of client business since 2008. These large firms are strategic suppliers, and have master service agreements with their largest global clients, who are willing to redirect a larger proportion of their business to firms in exchange for rate concessions and engagement of the firms’ top resources. This unique set of circumstances, where the Big Four continue to grow in advisory while smaller and mid-sized firms see their revenues and business equity decreasing, has prompted the Big Four to step up acquisitions in recent years. Many acquisitions by the Big Four occurred in the areas of strategy and operations consulting. Strategy in particular commands among the highest rates of all consulting practice areas. Deloitte confirms that it made 30 strategic acquisitions in fiscal 2013, and plans to continue in acquisition mode during fiscal 2014. Deloitte purchased strategy specialist, Monitor Group Company, out of bankruptcy in January 2013. Deloitte also made two attempts to purchase strategy specialist Roland Berger. The first attempt failed in November 2010, and the most recent talks were initiated in the first quarter of 2013. Deloitte also purchased significant portions of the BearingPoint public sector consulting operations out of bankruptcy. PwC’s acquisition of Booz & Co is not reflected in its fiscal 2013 numbers. It did close on its acquisition of digital media strategy consultancy, BGT, and bought HR performance management and analytics advisor, HumanR. It purchased Ant’s Eye View, a social media strategy consultancy, after acquiring Logan Todd & Co., a European operations consultancy in March 2012. PwC also acquired one of the world’s preeminent operations consulting firms, PRTM, in August 2011, after acquiring Diamond Management and Technology Consultants in November 2010. PwC made several smaller operations consulting acquisitions in 2009 that included Alaris and Paragon Consulting Group, and a large portion of BearingPoint’s commercial consulting operations out of bankruptcy. KPMG has focused on smaller strategic acquisitions, with a particular emphasis on IT strategy and outsourcing. It acquired certain portions of the IT consulting practice of Hackett Group in March 2013. The predecessor entity to Hackett, Answerthink, was a consultancy formed in 1997 by a group of former KPMG partners that left the firm before BearingPoint was split off. KPMG acquired UK-based strategic IT advisor Xanus in November 2012 and Canadian strategy and operations firm, Secor, in July 2012. It acquired German operations advisor, BrainNet, in June 2012. KPMG also acquired strategic outsourcing advisor, EquaTerra, in February 2011. Late in 2011, Ernst & Young acquired Brazil’s Axa Value Chain, a consultancy that focuses primarily on strategy and operations consulting. It also acquired performance management and analytics firm, ISA Consulting in Philadelphia. EY made mostly smaller focused acquisitions in the past, and has stayed away from large transactions with firms that have a large global presence. Its aggressive growth plans virtually assure that acquisitions are an important element of EY’s strategy. PwC’s Booz & Co has been on the other end of a few transactions itself in recent years. In April of 2013, Booz & Co closed the acquisition of Düsseldorf-based international operations consultancy, Management Engineers (ME), expanding the firm’s capabilities beyond strategy to include implementation services. Seventeen ME partners and 145 staff joined Booz & Co in that deal. Booz & Co acquired strategy and organization performance specialist, Katzenbach Partners, in July of 2009. The Big Four, as hybrid professional services firms, serve clients as the world’s largest auditors, as well as the largest multi-line consulting and advisory services firms in the markets they serve. This presents unique challenges for conflicts of interest. Our 2010, 2011 and 2012 Research Notes on this topic go into detail on relevant metrics, how they have changed, and what the operational and risk implications are for those changes. We believe it is reasonable to compare the full range of each Big Four firm’s professional services practices to one another. The exhibit at the top of this Note illustrates this for each firm across three metric categories for 2012 and 2013. The changes are evident, albeit less dramatic in some ways than in other years since 2010. For each of the Big Four firms, the ratio of audit revenues has decreased in relative proportion to advisory in the aggregate. The first Audit Conflict Risk Exposure Metric measures each firm’s audit revenues as a percentage of all fiscal 2013 non-audit work. This includes tax work, since it is advisory. Do not interpret this as our suggestion that Tax advisory presents the same level of potential conflict risk as other types of advisory work. But it is advisory and associated work by the Big Four that have been a focus of regulators in the wake of Arthur Andersen’s demise and the institution of legislation in the US related to auditors limiting provision of non-audit services to audit clients under Sarbanes Oxley. The second metric, which is perhaps the most important ratio, compares Audit revenues to non-tax advisory work. In this ratio, tax is excluded from the analysis, and we focus on how large that advisory share is compared to each firm’s total non-tax book of consulting business. The third ratio combines Audit and Tax, since these are services all audit firms provide. Here we draw a ratio between Audit/Tax work and all other advisory services. This metric may appear less relevant since it groups tax with audit, but it does offer the best presentation of the overall proportion of traditional “auditor” work to advisory. It is worth noting that with the exception of Deloitte, no other firm is within range of having audit/tax overtaken by consulting in the next 5 years. Each of the metrics noted above advanced in an unfavorable direction as the Big Four firms continued to rapidly expand the size of their advisory operations through organic growth and acquisitions. Between 2010 and 2013, consulting and advisory services have been, by far, the fastest growth areas of the businesses of each Big Four firm. This is evidenced in fiscal 2013 in particular, since PwC and KPMG actually experienced audit revenue declines in US dollars, with Deloitte showing an increase of less than 1 percent. As we noted in previous years, these statistics do not propose a correlation or causal link between specific independence or objectivity conflicts and a particular firm. There is simply not yet enough insight into the actual conflicts, or frankly agreement among experts on what actually constitutes a conflict. But it is obvious that conflicts increase for auditors when they do non-audit work for clients, and these ratios highlight the relative risk that certain firms face. We believe that analyzing the association with underwriters in insurance and banking services is uniquely relevant to auditors, since this lever is absent in the business models of the consulting firm contemporaries of auditors when they compete for advisory work. The Big Four, without exception, oppose the notion that non-audit services present risk that cannot be effectively mitigated. Those advocating such a perspective claim that limiting the ability of auditors to expand advisory practices is not warranted, primarily because they have effective internal “controls” in place with systems and processes that ensure regulatory compliance. We believe, however, that there are substantive regulatory compliance risks, and other unregulated risks, to stakeholders of public and private entities that must be transparently acknowledged, identified and mitigated. Banks understand the risk associated with underwriting standards as they apply to different clients, collateral, ability to pay and classes of loans. Every insurer carefully sets rates and underwriting standards based on different classes of insurable risk, combined with the effects of the current “hard” or “soft” market for that class of risk, and the insurer’s current cash flow and reserve needs. There are banks and insurers that have pushed beyond the limits of what constitutes good underwriting standards, trading “cash flow” now for the consequences of bad underwriting later. Expansion of non-audit services by auditors have similar motivations and consequences. The general public expects auditors to offer an opinion as to whether the financial statements of their client accurately reflect the financial condition of that business. That attestation “signature” has been a legacy definition of underwriting throughout time. The function of the auditor of public companies is in many ways similar to that of an underwriter in assessing the risk posed to investors of a company, and to the auditor if it fails to effectively perform its public accounting duty. In the past, auditors bore those risks with their reputations and licenses to practice. When firms were partnerships, that positively or negatively affected the fortunes of every firm principal acting as the signatory, and that went a long way toward ensuring audit integrity. Today, only four mega-firms render audit opinions on the financial statements of most of the world’s largest public companies. They are no longer structured as partnerships. Each of the audit firms acts as a large global coordinating entity for hundreds of separate corporations globally, each of which can be isolated from a legal standpoint and disposed of if necessary, with limited negative effect on the operations of the parent. The element of “control”, at least in theory, lies with the individual country-specific and service-line entities, and with the professionals that manage them. While the client looks at each of the Big Four as a single discrete entity, the behind-the-scenes entity structures are designed, in part, to minimize the possibility that any sanction issued as a result of misconduct, incompetence or acts outside the firm’s control would negatively affect them. They isolate and indemnify the firm staff and entities outside that legal structure from sanctions that might be imposed against them. This legal structure, while effective for its intended purpose, also has the effect of increasing the risk of moral hazard where conflicts of interest are concerned. This is true because many of the costs associated with compliance with legal and ethical mandates have been shifted away from the firm and its partners. Complex financial instruments like derivatives and the insurance policies put in place to indemnify the underwriters of those derivatives, inappropriately strained the underwriting standards of Goldman Sachs, AIG and PricewaterhouseCoopers, for example. This interdependent matrix of business stakeholders creates complex new pressures on the “audit system” to provide investors with assurances that they have the whole story about a company from a value perspective when many investors themselves are incapable of understanding the business of the company they are investing in. While the stakes have never been higher for effective audits, the incentive for (and consequences for not) delivering on that promise has never been lower. 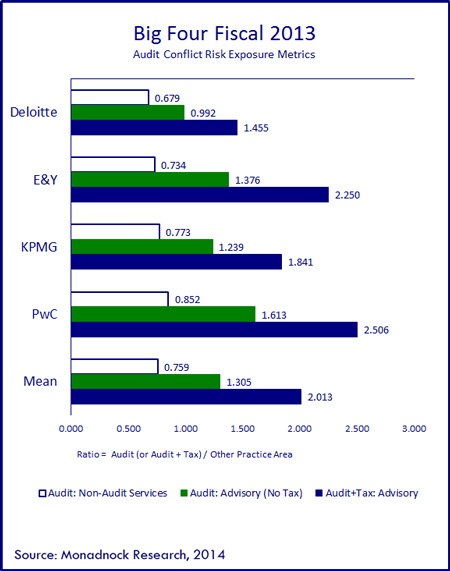 As you can see from the ratios detailed in the graphic at the top of this Research Note and in this section, each of the Big Four auditors now derives a much larger proportion of its work from advisory services than from audit work. With the balance of risk for an improperly performed audit shifting away from the partners of large firms personally, have the auditors lost their incentive to perform a proper audit? With such a large proportion of revenue from the universe of non-audit practice categories, is the primary business of the Big Four accounting firms no longer auditing? Has this audit-advisory imbalance created a moral hazard encouraging Big Four professionals to ignore issues that should be disclosed in audits; and have the Big Four advisory practices actually grown so large, in part, because they are mechanisms to exchange illicit value between clients and firms as payment for looking the other way? The answers to those questions will inform the decisions of clients, firm leaders and global regulators for years to come. The motivation for Monadnock Research to highlight this unique set of conditions is two-fold. First, we believe that the only incentive for a client to engage a consultant should be the intrinsic value of their independent objective advice. Second, allowing such a large inherently conflicted group of participants to thrive in the consulting marketplace will completely change the dynamic of decisions and irreparably harm the system of service providers. This set of circumstances also disproportionately harms the feeder system to the consulting marketplace, which is comprised of 10’s of thousands of smaller firms around the world providing high quality consulting services. The long-term impact will dramatically reduce the number of consulting firms and lower the quality of independent objective advice available to clients. We hope our Audit Conflict Risk Exposure Metrics can be employed as a tool to draw attention to the problem, and to ultimately achieve a solution that preserves the value of the consulting marketplace to clients, and the integrity of global financial markets. The analysis presented in this Note came from statistics published in the source documents linked above and from proprietary Monadnock Research. Each of the Big Four firms has a different year-end, so while this has not changed year-over-year, the periods compared in this analysis are different. Some of the reported values and computed metrics differ slightly from prior periods for figures previously reported and subsequently changed by PwC (2011 and 2012) and Ernst & Young (2010 and 2012) – who changed revenue distribution between audit and tax. Deloitte changed industry distribution of revenues for 2012 in 2013, and KPMG restated industry distribution in 2009, 2010, 2011 and 2012. We have not gone back to update published research with the new industry and practice area revenue distributions reported by the firms. Any periods analyzed in this report reflect practice revenue distribution as currently reported by firms, including changes to prior periods. Keep this in mind when comparing previous versions of this analysis published in prior years to information presented in this Note. All prior studies include revenue distribution as reported in the financial statements of the firms at that time, which are included in those 2012, 2011 and 2010 Research Notes. Some Deloitte statistics preserve separate reporting of Financial Advisory, and in other cases both categories have been combined into a single “Advisory” category so they could be compared to those of other Big Four firms that did not separately report Financial Advisory. Some Ernst & Young Advisory statistics preserve separate reporting of Transaction Advisory, and in other cases both categories were combined so they could be compared to those of other Big Four firms that did not separately report Transaction Advisory. PwC and Ernst & Young refer to Audit services as Assurance. Where we separately profile associated services for each firm we try to refer to it as the firm does. When the categories are reported in the aggregate, they are referred-to as Audit services for all firms. When we refer to Advisory services in this Research Note, we make no distinction between consulting and advisory services. We only refer to the general category as Advisory because that is how the firms that provide associated services (and the clients that engage them) most often refer to it. In recent years, this has changed as the Big Four have shifted away from audit work as primary within their books of business and branding, and now like to be known as large global multi-service-line firm networks that also provide audit services. Practice Category grouping seem off. Why not just Audi – Advisory – Tax breakdown? @Lauren: Audit, Advisory and Tax are broken out separately in most places. Two of the firms, EY (TAS) and Deloitte (FA), separately break-out two different types of consulting/advisory services, so that is combined into one advisory category in some cases and separately reported when profiling each Big Four firm’s practice distribution. In the Audit Conflict Risk Exposure Metrics presented here, if it is those practice breakdowns that you are referring-to, we use those three as well. We also highlight the fact that there is a different conflict risk exposure for a hypothetical firm that might provide audit services exclusively, versus one that might perform audit and tax advisory exclusively; and an even greater conflict risk posed by a firm that provides audit and advisory, or all three as each of the Big Four do. So those metrics attempt to compare the firms to one another using their F-2013 distribution of Audit, Tax and Advisory in an illustrative way, while preserving the fact that Tax and Advisory implicitly pose different levels of conflict risk.